Using scrap sheet metal and pop rivets, you can construct a model 1930s British Midget racer that combines vintage “tether car” styling with modern R/C capabilities. Radio control (R/C) toys are fun, but their plastic bodies are so obviously mass-produced. To create something more interesting, I wanted to find a metal toy racer 10 inches or longer that I could transplant some R/C insides into. I soon discovered that the best candidates were all precious collectibles. I decided to build a metal body myself and soon stumbled upon an old hobby called “tether cars,” a type of model racer that predates R/C (see Tether Cars: A Short History below). After ordering blueprints from a tether car enthusiast group in England, I learned how the old toys were made, and then ported the style to my R/C project. With a few modern adaptations, such as pop rivets instead of solder, and coil spring shocks, I built a couple of vintage-style R/C cars that would make any antique dealer jealous. Here’s my latest. R/C hobby manufacturers produce countless prefab parts. Some are great for combining with parts you make yourself. Sheet metal is a major component of junk everywhere, and with pop rivets and simple skills, you can turn this durable material into a model racer — or almost anything else. Regular sheet metal made from steel, is very forgiving: bend it wrong, and you can just hammer it flat again and start over. Thickness varies; I use between 18 and 24 gauge. Most sheet metal is coated to prevent rust. Tin-plate steel, also called simply “tin,” has a uniform shine. Galvanized steel, coated with zinc, sports a distinctive crystallized pattern. Stainless steel tends to be harder than regular steel, so it’s more difficult to work. If your tinsnips aren’t strong enough to get through it, try cutting with a rotary tool (Dremel). Aluminum is lightweight and soft, easy to work, but easy to dent and scratch. Aluminum also weakens when bent in the same spot too many times. But it has a beauty unto itself, and was once even considered a precious metal. Bending For most bends, you should use a sheet metal brake. Cheaper brakes can let the metal slip a bit, which puts the fold in the wrong place, but you can discourage this by first applying masking tape along the fold line and clamping the metal down. To bend small pieces of stiffer metal such as stainless, clamp them in a vise between wood blocks and hammer them over. Cutting Make paper templates for all the shapes you’re cutting. Then either stick them directly onto the metal with double-sided tape, or glue them to cereal-box cardboard, cut out, and trace around them on the metal with a fine-point marker. To help anchor larger templates, cut holes in the middle and tape over them. Cut shapes out with tinsnips or a Dremel cutting wheel, but note that a Dremel can sometimes make tape melt and slide around. File or sand the edges smooth after cutting. Drilling Center-punch holes before you drill, and use a high-quality drill bit with a sharp tip. I’ve bought some surprisingly bad drill bits, which wind up dancing around on the metal and biting in at the wrong place. Drill at 1/8″ for standard pop rivets. Riveting Insert a rivet through your hole. For extra strength, back it with a washer on the other side. Then squeeze with the pop rivet tool. To remove a rivet, drill it out using the same 1/8″ bit you made the hole with. To test-fit a rivet, you can hold it in place temporarily with a nail. Anything you want to make with sheet metal you can prototype first with cardboard. Just cut the pieces out, then fold and tape them together. This is an easy, fast, and cheap way of checking out a design before building. SAFETY: Always wear eye protection and tie up your hair while working with any power tools. Wear gloves during cutting; sheet metal can be sharp. 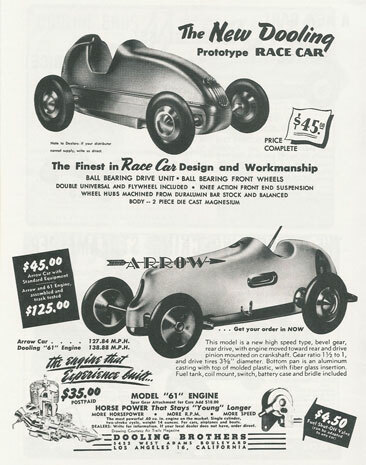 Tether cars, also known as spindizzies, are the miniature racing car hobby predecessor to the R/C era. Cars race one at a time around a circular track, tethered to a steel pipe that sticks up in the center, and accelerate with each lap. The hobby started in California in the 1930s, and back then the 10cc gas-powered cars would often exceed 50mph. Many cars looked like the midget racers (sprint cars) that were popular at the time. Tether cars have no brakes. To stop them, the car’s owner lowers a stick, flag, or broom over the car’s path as it passes underneath. This knocks down what looks like an antenna sticking up in back, but is actually a cut-off switch for the fuel or electrical supply. 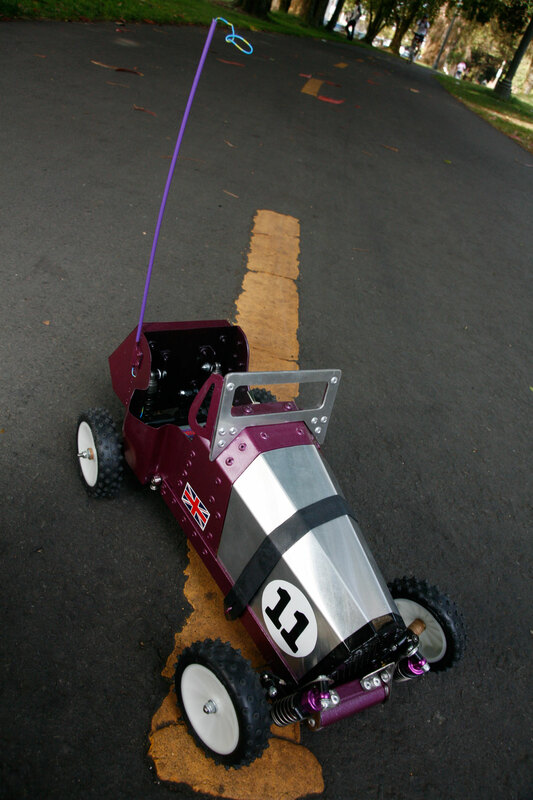 During World War II, tether car racing was put on hold in the United States, but it began flourishing in England. The British government grounded toy gas-powered airplanes and kites, fearing that spotters might mistake them for Nazi aircraft (I also wonder if they wanted to hide their near-ground radar capabilities). Then in 1942, D.A. Russell and A. Galeota published a design in the magazine Aeromodeller for a simple spindizzy powered by a 2.55cc gas engine that was originally built for model airplanes. It was an instant success, and tether car clubs soon formed all over England. Plans for vintage tether cars are available in books and online (see Resources), but they’re tough to build today because some of the transmission and drivetrain parts haven’t been manufactured for more than 60 years. You can still construct the bodies, though, and I think that steering and accelerating via radio control is more interesting than running around in a circle anyway. A vintage-style tether car body with modern R/C combines the best of both worlds. Steel sheet metal, tin or galvanized, about 20 gauge I used the case from an old Compaq tower. Thin aluminum I used an 18"×13" cookie sheet. Thick aluminum I used an old street sign. Stainless steel I used the reinforcing brackets from an old desk, around 18 gauge. Perforated sheet metal I used the ventilation panel from a very old computer. 5/32" round copper tubing, 6"
Any donor R/C car will work. I used mostly parts from a Bandit, from a box of used parts I bought from a neighbor for $25. If your parts differ from the following, you may have to adjust dimensions and construction details to fit. 2-channel radio control (R/C) system and compatible electronic speed control (ESC) I used a Futaba T2PH with a Tazer 15T ESC, bought on eBay for $20. 1. Print out the blue prints. 3. Make the front suspension. 6. Make the rear shock towers and trunk. 8. Finish the front end. 9. Install the gearbox, steering, and radio units. 10. Test, paint, and reassemble. Step #1: Print out the blue prints. Download the project blueprints page 1 and page 2 and print out at full size. The images are oversized (16"×24"), so with a letter-size printer you’ll need to print multi-page and tape the pieces together. Step #2: Make the frame. Cut section 1A out of the blueprints, glue to some scrap plywood, and let dry overnight. This is what we’ll be building on. Use a hacksaw to cut two 9" lengths of the 1/2"×3/4" aluminum angle. Use masking tape to hold the 2 pieces in their places on top of Section 1A. Cut 3A out of the blueprints, trace the template onto tin or galvanized sheet metal, and carefully cut out the part using tinsnips. Shape by folding along the dotted lines using a brake and pliers. Trace, cut, and shape part 2A. Note that the longest bend goes the opposite way from the other 3. Sand a small piece of wood to 11/16" thickness and cut to the shape of template 4A. Slide wood block into 2A. Place the 2A/4A combo into the front of the frame and 3A into the back. Drill 1/8" holes in parts 2A and 3A where indicated by the + symbols, and pop-rivet the frame together. Trace around a penny at the front end of each aluminum piece, then use a belt sander to round out the front of the frame. Cut and drill brass hinges following pattern B7. The sides of the hinges to cut are the ones with 2 loops around the pin, not the ones with 3. Slide the uncut sides of the hinges under the sides of the frame about 1/2" from the front. Tape and clamp everything back down without blocking the holes on 2A and 3A, then re-drill those holes, going through the frame and the hinges. Unclamp everything, and then pop-rivet the hinges to the frame, using washers underneath for added strength. Step #3: Make the front suspension. This is the most difficult part of the project — everything must be adjusted just right. Old tether cars had leaf springs, but I wanted a buggy-style independent spring suspension. Cut out sheet metal parts B3 and B4, the suspension arms that connect the hinges to the shocks and caster blocks. Drill 1/8" holes where indicated, and shape using pliers. Pop-rivet them to the hinges. Cut the front shock towers (B1 and B2) out of something strong. These parts take a lot of stress, so don’t use thin steel or aluminum. I used stainless, cutting the parts with a rotary tool and then filing them down. Use a vise and a hammer to bend the shock towers following the patterns. Bend them to only about 80° and make sure the 2 angles are the same. These towers connect the frame to the tops of the shock absorbers. Drill towers B1 and B2 with the 1" holes indicated by arrows on the blueprint. Pop-rivet to the car frame, over the hinges. Gauging with a drafting triangle, pivot each tower to lean slightly forward so that its top edge lies 3/8" from vertical. Clamp them in position, then drill and rivet the 2 holes next to the existing rivet to secure the towers to the frame. Cut and bend shock tower brackets B5 and B6 out of the same metal as B1 and B2. Clamp them into place on the front of the frame so that the flat sides sit parallel to the back of 2A and the side tabs sit flush against the tower. Drill and rivet the bracket tabs to the towers and the frame. Don’t drill all the way through the wood; just go far enough to accommodate the rivet, which serves as a nail here. Use machine screws and bolts to attach each front shock between the top of its tower and the front of its suspension arm. Bolt the bottom of each caster block into its arm. Assemble the car’s turnbuckles, substituting shorter 3/4" rods for the originals, then connect one end to the top of the caster block and bolt the other to the back of the shock tower at about the same horizontal level. Connect the steering blocks to the caster blocks using suspension pins. Step #4: Make the body. If you’re using a Traxxas Tom Cat/Spirit gearbox, trace the cab pattern 1C onto thin sheet metal, cut out using tinsnips, and flatten using a hammer and scrap plywood. With a smaller gearbox you can use pattern 2C. Smooth the edges of the metal using a file and sandpaper, then bend the cab following the pattern. Use a brake for the large bends and pliers for the smaller ones. Make sure the body is square. The blueprints also include an optional side cab, part 3C, which you can add on for looks. Trace pattern D1, for the hood, onto aluminum, then cut out slowly using a cutting wheel (don’t use tinsnips). File edges. Use a brake and pliers to bend the hood along the lines indicated on D1. NOTE: Beginners might cut piece D1 out of tin, which is more forgiving if you need to tweak the bends. Cut out template G1, the radiator grille, and slide it into the front of the hood. Trim the template to fit, then trace onto perforated sheet metal. Cut out the sheet metal grille and check the fit carefully before riveting. Drill and rivet the grille onto the hood. Cut paper template D1 into parts D2 and D3, as indicated. Tape the scuttle template, D2, onto the hood, and then trace onto the metal. Use a cutting wheel to carefully cut the hood along the line you just traced, then file down any marks. Slide the cab, scuttle, and hood into the frame. C-clamp the scuttle to the frame, remove the hood, and then drill and pop-rivet the cab and scuttle into place. Cut, smooth, and bend hood lip F1. Fit under the scuttle, then clamp it down, drill, and rivet into place. NOTE: Be sure that F1 points slightly downward so that the scuttle will be at the same angle as the hood. Step #6: Make the rear shock towers and trunk. Cut two 2" lengths of the 1/2"x1/2" aluminum angle. Drill according to patterns 4C and 5C, then rivet side-by-side to the inside back of the cab, centered 1-1/2" apart and vertical. These are the rear shock towers. Cut 2 more pieces of the 1/2" aluminum to 3-1/2" in length, and drill as parts E3 and its adjacent E2, the trunk brackets. Rivet to either side of the back of the cab, so they stick out vertically with an outside distance of 3-1/2" apart. Out of thin steel, cut out 2 trunk side pieces following template E1 and 1 trunk cover piece, E2. Drill, bend using a brake, and rivet together. Fit the assembled trunk over the trunk brackets, drill through from the sides, and rivet into place. For the antenna bracket, fold a 1-3/4"x 3/4" piece of sheet metal around some 5/32" copper tubing using some pliers. Cut 1" of the tubing to remain in the bracket, then center-punch and drill holes on each side of the folded tab. Drill and pop-rivet the bracket next to the trunk. The plastic radio antenna will slide perfectly into the tubing. Step #8: Finish the front end. Trace windshield template H1 onto thick aluminum and cut out with a cutting wheel. Sand and file all the edges smooth. File the inside edges by hand. Trace and cut windshield bracket H2 onto thin steel. Bend the tabs on H2 using pliers, and check the bends for proper fit by placing it on top of the scuttle. Cut 2 side curtains H3 out of thicker steel, bend in a vise, cut the inside using a cutting wheel, and file smooth outside and inside. Fit bracket H2 onto the scuttle using small clamps, then clamp windshield H1 onto the bracket. Unclamp the pieces from the scuttle, then drill and rivet together. Clamp, drill, and rivet the side curtains H3 to the windshield, then position this assembly back on the scuttle and drill through the bracket and scuttle. Bolt into place using small nuts and bolts. NOTE: Use an old rag in the vise to prevent the metal from getting marred. Optional: I wanted a switch on the dash, so I made a bracket out of stainless, following template I1, and used a large bit to drill the hole for the toggle. I bolted the switch to the scuttle, and hooked it up by cutting the receiver unit’s power wires and soldering them to the switch’s terminals. As in a vintage car, the hood is held down with a strap. Make it by cutting an 11"×3/4" strip from an old bicycle inner tube. Then cover each end with electrical tape and cut a slit for attaching it to the hooks under the car. On another model car I used leather instead of rubber, making it more authentic. Make the hood strap hooks out of a wire coat hanger. Cut 2" pieces, then use needlenose pliers to make hooks on one side and loops on the other. Pop-rivet the loops under the frame. Step #9: Install the gearbox, steering, and radio units. Cut off the ball joint pivot that protrudes from the front of the gearbox assembly. Thread a 1/8" metal rod through the horizontal sleeve on the gearbox that sits just under the old ball joint. Attach the rear shocks to the back of the gearbox, then drill and bolt the other ends to the rear shock towers. Connect the front of the gearbox by drilling holes in the frame for the metal rod to thread through, then trim the excess length and secure it with lock collars at each end. Put brass bushings onto the steering shafts, then install the front wheels and tires. Cut frame bracket 5A out of thick aluminum and rivet it flat into the frame. Bolt the servo unit to 3A and 5A so that the steering rods run underneath the frame. To boost undercarriage clearance, I raised the steering unit up on 1/2"-thick wooden spacers. Install the receiver and speed control boxes behind the servo, on opposite sides of the frame, under the scuttle. I cut and riveted small brackets to hold them, but you can also just use double-sided foam tape. Use scrap metal and rivets or bolts to connect the rods up to the steering block arms. Or, if the rods are long enough, you can bend them up to reach. I used some junk brass rod with rivets. Connect the battery unit and install it in front of the servo. I drilled holes in 3A and 5A, looped wire tightly between the 2 on either side, and used more wire to suspend the battery between the 2 loops. Step #10: Test, paint, and reassemble. 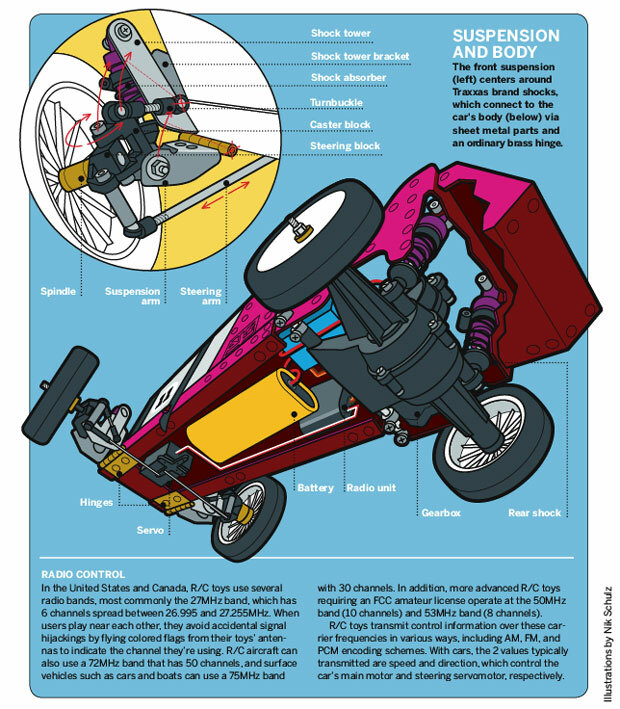 Adjust the turnbuckles so that the front wheels are straight. Confirm that everything is connected and test the car out with the radio. If everything works properly, disassemble the body pieces and paint with lacquer, starting with a coat of primer. I used Plasti-Kote Burgundy Metal Flake for most of the body and black for the inside. In honor of this issue of MAKE, I painted on a number 11. Let lacquer dry, and reassemble the car. You’re done! Maintenance and Adjustments: Keep all moving parts working freely, with no rubbing of any kind. If a part is rubbing the wrong way, adjust it with pliers or file it down. Also, make sure the front shocks don’t press down too hard on the hinges, or they won’t rebound fast enough. Make sure the nuts and bolts that hold the caster blocks in the front suspension arms aren’t too tight. The block should be able to pivot; if not, add some washers and oil to the joint. Frank E. Yost is an artist from Minnesota with interests like biking, drawing, woodcarving, bronze casting, welding, and R/C cars. He is planning to release a new book on Kindle soon called The Giant Water Tower.